Webster Luke AFB faculty member Herb Kretz presents bags of stuffed animals to Sgt. Jeff Turney (MA '04) for the Glendale PD's "Trauma Teddy" program. A local initiative to help police assist small children has garnered support from Webster University’s Luke Air Force Base location — and deepened an alumni connection with one of the first responders. The City of Glendale’s “Trauma Teddy” program collects donated stuffed animals, which first responders use to comfort young children who have been affected by a traumatic event such as a traffic accident or other incidents involving first responders. When Herb Kretz, an adjunct faculty member at Webster’s Luke AFB campus location, told his wife, Gail, about the program, they both decided to jump into action. Their first goal: start looking for bears, unicorns, ducks and other stuffed, huggable animals. 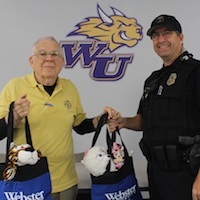 After Kretz brought in several bags of new small stuffed toys he and Gail had collected, the campus office contacted Sgt. Jeff Turney (MA ’04, Business and Organizational Security Management) of the Glendale, Arizona, Police Department to arrange the donation. Turney said he always keeps the toys in his police vehicle and they definitely make a difference in helping to calm down children and make them feel more secure during a traumatic moment. Turney is a 2004 Webster graduate with an Master of Arts in Business and Organization Security Management. He is also the chair of the Military and Veteran’s Affairs committee of the Glendale Chamber of Commerce, on which Webster Luke AFB director David Handrahan also serves. Though Turney never took a class from Kretz — who is Webster Luke AFB’s longest-serving faculty member — the two met when Kretz delivered the donation. His specialty is Marketing (MRKT 5000) though he also delivered BUSN 5000 and BUSN 5200.